This technology was originally developed in mainframe or workstation computers as a core part of the "virtual reality" environment but it is now growing with rapid popularity in the personal computer domain, especially for stereoscopic computer games. 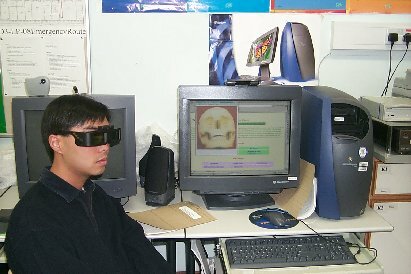 The users need to wear a pair of 3D shutter glasses to visualise the 3D pictures and 3D videos displayed on a computer monitor or a television set. There is a continuous train of signal being emitted from the computer via electrical wire or infra-red to synchronize with the images/videos displayed on the computer monitor. The right-hand and left-hand LCD shutter glasses will then turn on and off sequentially to let the observer's right and left eyes view the corresponding right-hand and left-hand images of the objects or videos. Because of the fairly high refresh rate (>60 frames per second), the viewer's human brain will treat the images from the two eyes to arrive simultaneously and combine them to form the 3D images which produce the depth clues. Almost all people can see the 3D effects without difficulties but prolonged viewing may cause some unpleasant feeling to some people. Although the quality of this technology is very good, the price of the hardware for viewing is not very low (around US$100 per each set of spectacles and emitter). Hint: you may need to render (e.g. by clicking on the image directly) each of the above image to its full size in order to visualise the 3D effect. Copyright (C) 1999-2009. HKIEd HAS Centre. All Rights Reserved.